In 2014, there were at least 93 peer-reviewed scientific papers published in scientific journals affirming the Sun’s influential role in climate change. In 2015, there were at least 95 scientific papers affirming the Sun-Climate link. Already in 2016, there have been over 100 papers (107 to date) published in science journals affirming the link between solar forcing and climate change. The list of papers and brief excerpts (from the abstracts, introductions, and/or conclusions) is provided below. The Sun’s Influence On Climate: ‘Settled’ Science? It has long been claimed that the science is “settled”, that the Sun’s role in climate change is negligible at best. The Sun no longer causes net global-scale changes in deep ocean heat. Humans do that now. By emitting carbon dioxide, it is claimed that humans have predominantly caused (or will cause) net global-scale changes in precipitation, extreme weather events (hurricanes, tornadoes, droughts, floods…), water vapor, clouds, sea level, and, of course, atmospheric and surface temperatures. According to some interpretations (i.e., NASA’s Gavin Schmidt), the IPCC apparently estimates that the anthropogenic attribution to climate change is essentially 100% (or more), and the Sun’s influence in forcing net changes in the climate system is effectively zero. Of course, a 0% attribution for solar forcing assumes that we presently know enough already about the Sun and how it influences terrestrial climate change and ocean heat flux. It assumes that we are and have been accurately calculating the response of the climate system to variations in absorbed solar heat energy, and that we are and have been accurately measuring absorbed solar heat energy. It assumes there is little uncertainty and there are no consequential errors in our reconstructions and modeling of solar radiative forcing over time (or recently). The popularized insistence by advocates that a 100% attribution for anthropogenic climate forcing is “settled” science necessarily implies that skepticism concerning the claim that there is effectively no Sun-Climate link is unwarranted and antagonistically feckless. Those who do dare question the profundity of our present scientific knowledge of the Sun-Climate link deserved to be ridiculed, marginalized, and compared to Holocaust deniers. Fortunately, there are still some scientists willing to admit that we still don’t know all that much about the Sun’s role in climate change. For example, Dhomse et al. (2016) acknowledge that the Sun’s role in climate change is still “an open scientific question” due to the immense difficulties in accurately quantifying the Sun’s influence. [T]here are still large [uncertainties] in current observational and meteorological reanalysis datasets, so accurate quantification of the influence of solar flux variability on the climate system remains an open scientific question. And below, there are literally hundreds of scientists who have dared to continue trying to disentangle the Sun’s role in climate changes — and who have wound up finding robust connections. Perhaps someday the IPCC will consider scientific papers like these in their reports rather than continue to operate on the presupposition that our scientific knowledge of the Sun’s role in climate change is not only substantial, but sufficient. 1. Sánchez-Sesma, 2016 [W]e found that, on one side, the recent CO2 increase can be considered as a lagged response to solar activity, and, on the other side, the continental tropical climate signal during late Holocene can be considered as a sum of three lagged responses to solar activity, through direct, and indirect (volcanic and CO2), influences with different lags of around 40, 800 and 1600 years. 2. Yamakawa et al., 2016 This study attempted to determine the relationships between solar activity and SST. Instrumental data from 1901 to 2011 revealed a significant positive relationship on a global basis. … The analysis of the relationship between variations in solar activity and SST from 1901 to 2011 indicated that sunspot numbers and SST were positively correlated in wide areas, with statistically significant positive correlations in many regions…. Analyses of the relationships between solar activity and the Earth’s climate system also revealed relationships between variations in solar activity and circulation in the troposphere. It is worthy of note that the highest coefficients at a 29-month lag were found in the relationships both between SSN [sunspot number] and PDO [Pacific Decadal Oscillation], and SSN and CP El Niño with statistical significance at the 99% confidence level, respectively. 3. Luening and Vahrenholt, 2016 The amplitude of the observed temperature fluctuations is often more than 1°C and thus has a similar or even greater range than the warming that has occurred since the Little Ice Age. Furthermore, many of these Holocene, natural climate fluctuations show the same level of abruptness as the 20th-century warming. A common characteristic of many of the documented millennial climate fluctuations is their good match with solar activity changes, as well as a North Atlantic climate record by Bond et al. (2001). Besides solar activity changes, internal millennial ocean cycles may have contributed to the observed climate oscillations. 4. de Larminat, 2016 [T]he recent anthropogenic contribution is found to be less than the contribution of solar activity. Reflecting the predominance of internal variability in the error output, the natural contribution (solar and volcanic activities, plus internal variability) becomes clearly much greater than the anthropogenic contribution in the recent warming. 5. Harde, 2016 Including solar and cloud effects as well as all relevant feedback processes our simulations give an equilibrium climate sensitivity of CS = 0.7 °C (temperature increase at doubled CO2) and a solar sensitivity of SS = 0.17 °C (at 0.1 % increase of the total solar irradiance). Then CO2 contributes 40 % and the Sun 60 % to global warming over the last century. 6. Bonomo et al., 2016 The calcareous nannofossil assemblages as well as their diversity index are modulated by oscillation in solar activity, where minima in solar activity correspond to minima calcareous nannofossil diversity and vice versa. In particular, the antiphase correlation between the abundance of Reworked Coccoliths and the North Atlantic Oscillation index, which modulates winter precipitation, suggests that this biotic index could be used as a reliable proxy to reconstruct the variations in the hydrographic basin runoff of the Volturno and Garigliano rivers. In addition, power spectral and wavelet analysis carried out on both signals documented the occurrence of climatic cycles of the duration of about 95 yr. From 1900 AD upwards, a turnover in the periodicity from 95 yr climatic cycles to 22–26 yr cycles occurred in the Reworked Coccoliths signal, suggesting a strong control of solar forcing (Hale cycle) over the last century. 7. Malik et al., 2016 In this study, we undertake another effort towards understanding the role of the Sun in changing or varying the Earth’s climate on seasonal to decadal time scale. We focus on effects of varying solar activity on All Indian Summer Monsoon Rainfall (AISMR) and try to investigate how much the prediction of AISMR on a seasonal to decadal time scale can be improved by considering the solar irradiance variability in climate models. … Further, in our analysis we have found strong statistical evidence of the influence of solar activity on AMO and AISMR. We have found highly statistically significant evidence that North Atlantic SSTs are positively correlated with TSI on annual (CC 0.46), decadal (CC 0.55) and multidecadal time scales (CC 0.42) during the period 1600-2000. Also AMO influences the Niño3 and AISMR. 9. Kodera et al., 2016 Conclusion: In summary, diverse aspects of the solar signal on the Earth’s surface can be explained solely by solar UV heating changes in the upper stratosphere which penetrate the troposphere through two pathways: the stratospheric westerly jet in the extratropics, and the stratospheric mean meridional circulation in the tropics, as suggested by Kodera and Kuroda (2002). … [C]entennial-scale solar signals could also be explained by a change in the spectral distribution of solar irradiance, with changes only in the UV part of the solar spectrum, even if the change in total energy was negligibly small. 10. Hassan et al., 2016 The various techniques have been used to confer the existence of significant relations between the number of Sunspots and different terrestrial climate parameters such as rainfall, temperature, dewdrops, aerosol and ENSO etc.. …This study uses a Markov chain method to find the relations between monthly Sunspots and ENSO data of two epochs (1996–2009 and 1950–2014) … [P]erfect validation of dependency and stationary tests endorses the applicability of the Markov chain analyses on Sunspots and ENSO data. This shows that a significant relation between Sunspots and ENSO data exists. 11. Salas et al., 2016 The investigation assesses the influence of recent climatic events in the water resources and the aquifer dynamics in the Huasco watershed by means of the analysis of precipitation, streamflow and piezometric levels during the last 50 years. … Water reservoirs in the main aquifer (Section III) and in the Santa Juana dam are highly sensitive to ENSO oscillation climatic patterns. … .Spectral analysis identified the presence of a 22.9-year cycle in piezometric levels of the alluvial aquifer of the Huasco River. This cycle is consistent with the 22-year Hale solar cycle, suggesting the existence of a solar forcing controlling the ENSO oscillations. 12. Nurtaev, 2016 Introduction: Sunspot number time series can be conceived as indicators of climate trends. Extraterrestrial solar-irradiance variations are associated with variations in regional climatology by means of global atmospheric circulation. [S]olar observations over the last century show a long term increase trend of solar activity. During this period also was observed an increase in temperature in the Northern Hemisphere. 13. Malik and Brönnimann, 2016 We conclude that the positive relation between AISMR [All Indian Summer Monsoon Rainfall] and solar activity, as found by other authors, is due to the combined effect of AMO, PDO and multi-decadal ENSO variability on AISMR. The solar activity influences the ICFs [internal climate forcings] and this influence is then transmitted to AISMR. … We also find that there is statistical significant negative relationship between AISMR and ENSO on inter-annual to centennial time scale and the strength of this relationship is modulated by solar activity from 3 to 40 year time scale. 14. Perone et al., 2016 Evident correlation among solar activity, ENSO effect, tree ring during 20th century … Tree rings reveal climatic variations through years, but also the effect of solar activity in influencing the climate on a large scale. … In the Chilean and Argentinian sites, significant agreement between the time series of tree rings and the 11-year solar cycle was found during the periods of maximum solar activity. Results also showed oscillation with periods of 2–7 years, probably induced by local environmental variations, and possibly also related to the El-Niño events. … These results provided new evidence on the solar activity-climate pattern-tree ring connections over centuries. 15. Mursula, 2016 Solar mass emission and climate … The new long-term information also allows interesting possibilities to more reliably study the long-term evolution of solar effects in the Earth’s atmosphere and climate. E.g., there is evidence that processes related to HSSs [solar wind streams] may modulate regional/hemispheric climate patterns, in particular the NAO/NAM oscillation. Moreover, other, independent climate effects due to the HMF [heliospheric magnetic field] have been suggested. 16. Gray et al., 2016 Results from a previous 11-year solar cycle signal study of the period 1870–2010 (140 years; ~13 solar cycles) that suggested a 3–4 year lagged signal in SLP over the Atlantic are confirmed by analysis of a much longer reconstructed dataset for the period 1660–2010 (350 years; ~32 solar cycles). … Corresponding analysis of DJF [December-February]-averaged Atlantic / European blocking frequency shows a highly statistically significant [solar] signal at ~1-year lag that originates primarily from the late winter response. The 11-year solar signal in DJF [December-February] blocking frequency is compared with other known influences from ENSO and the AMO and found to be as large in amplitude and have a larger region of statistical significance. 17. Zhou et al., 2016 A significant correlation between the solar wind speed (SWS) and sea surface temperature (SST) in the region of the North Atlantic Ocean has been found for the Northern Hemisphere winter from 1963 to 2010, based on 3-month seasonal averages. … SST responds to changes in tropospheric dynamics via wind stress, and to changes in cloud cover affecting the radiative balance. Suggested mechanisms for the solar influence on SST include changes in atmospheric ionization and cloud microphysics affecting cloud cover, storm invigoration, and tropospheric dynamics. … [D]irect solar inputs, including energetic particles and solar UV, produce stratospheric dynamical changes. Downward propagation of stratospheric dynamical changes eventually further perturbs tropospheric dynamics and SST. 18. Ball et al., 2016 Solar variability can influence surface climate, for example by affecting the mid-to-high-latitude surface pressure gradient associated with the North Atlantic Oscillation. One key mechanism behind such an influence is the absorption of solar ultraviolet (UV) radiation by ozone in the tropical stratosphere, a process that modifies temperature and wind patterns and hence wave propagation and atmospheric circulation. The amplitude of UV variability is uncertain, yet it directly affects the magnitude of the climate response: observations from the SOlar Radiation and Climate Experiment (SORCE) satellite show broadband changes up to three times larger than previous measurements. 19. Tedesco et al., 2016 The surface energy balance and meltwater production of the Greenland ice sheet (GrIS) are modulated by snow and ice albedo through the amount of absorbed solar radiation. Here we show, using space-borne multispectral data collected during the 3 decades from 1981 to 2012, that summertime surface albedo over the GrIS decreased at a statistically significant (99 %) rate of 0.02 decade−1 between 1996 and 2012. … Net solar radiation is the most significant driver of summer surface melt over the GrIS (van den Broeke et al., 2011; Tedesco et al., 2011), and is determined by the combination of the amount of incoming solar radiation and surface albedo. 20. Elsharkawy and Elmallah, 2016 [C]ross-correlation and spectral analysis techniques are applied to investigate the influence of terrestrial and extraterrestrial parameters, represented by North Atlantic Oscillations, NAO, and sunspot number, Rz, respectively, upon regional temperature. … Correlation results showed highest influences upon autumn and winter coast temperatures by Rz [sunspot number] and NAO during 1981-2010. … NAO is a potential transmitter of solar forcing as it acts as a mediator between the Sun and Earth’s climate. 21. Scafetta, 2016 The quasi-secular beat oscillations hindcast reasonably well the known prolonged periods of low solar activity during the last millennium such as the Oort, Wolf, Sporer, Maunder and Dalton minima, as well as the 17 115-year long oscillations found in a detailed temperature reconstruction of the Northern Hemisphere covering the last 2000 years. The millennial cycle hindcasts equivalent solar and climate cycles for 12,000 years. Finally, the harmonic model herein proposed reconstructs the prolonged solar minima that occurred during 1900- 1920 and 1960-1980 and the secular solar maxima around 1870-1890, 1940-1950 and 1995-2005 and a secular upward trending during the 20th century: this modulated trending agrees well with some solar proxy model, with the ACRIM TSI satellite composite and with the global surface temperature modulation since 1850. … [R]esults clearly indicate that both solar and climate oscillations are linked to planetary motion and, furthermore, their timing can be reasonably hindcast and forecast for decades, centuries and millennia. 22. Czymzik et al., 2016 Flood frequency in both records is significantly correlated to changes in solar activity from the solar Schwabe cycle to multi-centennial oscillations. These significant correlations suggest a solar influence on the frequency of hydroclimate extremes in central Europe. Similar configurations of atmospheric circulation during periods of increased flood frequency and reduced solar activity, as expected to be caused by the so-called solar top-down mechanism by model studies, might indicate that the observed solar activity–flood frequency linkage is related to this feedback. … [N]umerous empirical associations between the activity of the Sun and climate variables like temperature, precipitation, atmospheric circulation and frequency and intensity of hydrometeorological extremes indicate a solar influence on climate on regional scales (Adolphi et al., 2014; Bond et al., 2001; Fleitmann et al., 2003; Gray et al., 2010; Lockwood, 2012; Wirth et al., 2013). 23. Serykh and Sonechkin, 2016 Basing on a mathematical idea about the so-called strange nonchaotic attractor (SNA) in the quasi-periodically forced dynamical systems, the currently available re-analyses data are considered. It is found that the El Niño – Southern Oscillation (ENSO) is driven not only by the seasonal heating, but also by three more external periodicities (incommensurate to the annual period) associated with the ~18.6-year lunar-solar nutation of the Earth rotation axis, ~11-year sunspot activity cycle and the ~14-month Chandler wobble in the Earth’s pole motion. 24. Gopalswamy, 2016 Coronal mass ejections (CMEs) are relatively a recently discovered phenomenon—in 1971, some 15 years into the Space Era. It took another two decades to realize that CMEs are the most important players in solar terrestrial relationship as the root cause of severe weather in Earth’s space environment. 25. Bronck and Sirocko, 2016 The statistical analysis of all 92 historical freezing events showed that 80 events occurred during a negative NAO winter phase. The bootstrap test defined the results as extremely significant. To understand the climatic forcing behind the freezing chronology the NAO data set was smoothed by a three point running mean filter and compared with the 11- year cyclicity of the sunspot numbers. A complete NAO cycle can be observed within each solar cycle back to 1960 and from 1820 to 1900…. [T]he 11 year solar periodicity is related to various parts of the Earth/Ocean/Atmosphere system and not only to the stratospheric signal. However, the NAO is the dominating mediator to implement a solar component into the European winter extremes. 26. Scafetta, 2016 This study investigates the existence of a multi-frequency spectral coherence between planetary and global surface temperature oscillations by using advanced techniques of coherence analysis and statistical significance tests. … [U]sing the canonical coordinates analysis at least five coherent frequencies at the 95% significance level are found at the following periods: 6.6, 7.4, 14, 20 and 60 years. Thus, high resolution coherence analysis confirms that the climate system can be partially modulated by astronomical forces of gravitational, electromagnetic and solar origin. … Numerous evidences for a solar influence on the climate at multiple scales are also well-known (e.g. : Hoyt and Schatten, 1997). More recently, several authors have advocated a planetary theory of solar and climate oscillations on shorter scales (e.g. : Abreu et al., 2012, Charvátová, 2009, Cionco and Soon, 2015, Hung, 2007, Jakubcová and Pick, 1986, Jose, 1965, McCracken et al., 2013, McCracken et al., 2014, Mörner et al., 2013, Mörner, 2015, Puetz et al., 2014, Salvador, 2013, Solheim, 2013, Tan and Cheng, 2013, Tattersall, 2013 and Wilson, 2013) … A coupling between planetary oscillations and climate change must necessarily involve a complex and long chain of physical mechanisms that are being investigated in the scientific literature. … Finally, an astronomically induced albedo variation could easily induce climatic variations. In fact, if the Earth’s albedo oscillates by just a few percent driven by astronomical forcings, the resulting oscillations would be sufficient to induce the observed climatic oscillations because these are of the order of a fraction of Celsius degree. 27. Martínez-Asensio et al., 2016 Autumn sea level extremes vary with the 11-year solar cycle at Venice as suggested by previous studies but a similar link is also found at Trieste. In addition, a solar signal in winter sea level extremes is also found at Venice, Trieste, Marseille, Ceuta, Brest and Newlyn. The influence of the solar cycle is also evident in the sea level extremes derived from a barotropic model with spatial patterns that are consistent with the correlations obtained at the tide gauges. This agreement indicates that the link to the solar cycle is through modulation of the atmospheric forcing. 28. Weißbach et al., 2016 Compared to single records, this stack represents the mean δ18O signal for northern Greenland that is interpreted as proxy for temperature. Our northern Greenland δ18O stack indicates distinctly enriched [warm] δ18O values during medieval times, about AD 1420 ± 20 and from AD 1870 onwards. The period between AD 1420 and AD 1850 has depleted [cold] δ18O values compared to the average for the entire millennium and represents the Little Ice Age. The δ18O values of the 20th century are comparable to the medieval period but are lower than that about AD 1420. …. The solar activity and internal Arctic climate dynamics are likely the main factors influencing the temperature in northern Greenland. 29. Svensmark et al., 2016 [press release] Solar activity has a direct impact on the Earth’s cloud cover … The solar eruptions are known to shield Earth’s atmosphere from cosmic rays. However the new study, published in Journal of Geophysical Research: Space Physics, shows that the global cloud cover is simultaneously reduced, supporting the idea that cosmic rays are important for cloud formation. The eruptions cause a reduction in cloud fraction of about 2 percent corresponding to roughly a billion tonnes of liquid water disappearing from the atmosphere. Since clouds are known to affect global temperatures on longer timescales, the present investigation represents an important step in the understanding of clouds and climate variability. “Earth is under constant bombardment by particles from space called galactic cosmic rays. Violent eruptions at the Sun’s surface can blow these cosmic rays away from Earth for about a week. Our study has shown that when the cosmic rays are reduced in this way there is a corresponding reduction in Earth’s cloud cover. Since clouds are an important factor in controlling the temperature on Earth our results may have implications for climate change,” explains lead author on the study Jacob Svensmark of DTU. … The effect from Forbush decreases on clouds is too brief to have any impact on long-term temperature changes. However, since clouds are affected by short term changes in galactic cosmic radiation, they may well also be affected by the slower change in Solar activity that happens on scales from tens to hundreds of years, and thus play a role in the radiation budget that determines the global temperature. The Sun’s contribution to past and future climate change may thus be larger than merely the direct changes in radiation, concludes the scientists behind the new study. 30. Lenz et al., 2016 Two palynological analyses of 6.3 and 70 kyr long records with a temporal resolution of 70 and 700 years respectively confirm vegetation and climate variability in the sub-Milankovitch range. This variability clearly corresponds to cyclic climate fluctuations indicating the influence of solar activity and a millennial-scale variability of the El Niño–Southern Oscillation also seen during the Quaternary icehouse system. 31. Haig and Nott, 2016 The development of a new tropical cyclone activity index spanning the last 1500 years has enabled the examination of tropical cyclone climatology at higher temporal resolution than was previously possible. Here we show that in addition to other well-known climate indices, solar forcing largely drives decadal, interdecadal, and centennial cycles within the tropical cyclone record. 32. Arsenovic et al., 2016 We investigate the influence of Middle Range Energy Electrons (MEE; typically 30-300 keV) precipitation on the atmosphere using the SOCOL3-MPIOM chemistry-climate model with coupled ocean. … Results show that during geomagnetically active periods MEE [Middle Range Energy Electrons] significantly increase the amount of NOy and HOx in the polar winter mesosphere, in addition to other particles and sources, resulting in local ozone decreases of up to 35%. These changes are followed by an intensification of the polar night jet, as well as mesospheric warming and stratospheric cooling. … A surface air temperature response is detected in several regions, with the most pronounced warming occurring in the Antarctic during austral winter. Surface warming of up to 2 K is also seen over continental Asia during boreal winter. 33. Wang et al., 2016 The broad comparability between the HML paleo-proxies, Chinese speleothem δ18Orecords, and the northern hemisphere summer insolation throughout the Holocene, suggests that solar insolation exerts a profound influence on ASM [Asian summer monsoon] changes. These findings reinforce a model of combined insolation and glacial forcing of the ASM. 34. Huo and Xiao, 2016 The impact of solar activity on the 2015/16 El Niño event … Recent SST and atmospheric circulation anomaly data suggest that the 2015/16 El Niño event is quickly decaying. Some researchers have predicted a forthcoming La Niña event in late summer or early fall 2016. From the perspective of the modulation of tropical SST by solar activity, the authors studied the evolution of the 2015/16 El Niño event, which occurred right after the 2014 solar peak year. Based on statistical and composite analysis, a significant positive correlation was found between sunspot number index and El Niño Modoki index, with a lag of two years. A clear evolution of El Niño Modoki events was found within 1–3 years following each solar peak year during the past 126 years, suggesting that anomalously strong solar activity during solar peak periods favors the triggering of an El Niño Modoki event. The patterns of seasonal mean SST and wind anomalies since 2014 are more like a mixture of two types of El Niño (i.e., eastern Pacific El Niño and El Niño Modoki), which is similar to the pattern modulated by solar activity during the years following a solar peak. Therefore, the El Niño Modoki component in the 2015/16 El Niño event may be a consequence of solar activity, which probably will not decay as quickly as the eastern Pacific El Niño component. The positive SST anomaly will probably sustain in the central equatorial Pacific (around the dateline) and the northeastern Pacific along the coast of North America, with a low-intensity level, during the second half of 2016. 35. Wahab et al., 2016 Understanding the influence of solar variability on the Earth’s climate requires knowledge of solar variability, solar interactions, and the mechanisms explain the response of the Earth’s climate system. The NAO (North Atlantic oscillation) is one of the most dominant modes of global climate variability. Like El Niño, La Niña, and the Southern Oscillation, it is considered as free internal oscillation of the climate system not subjected to external forcing. It is shown, to be linked to energetic solar eruptions. Surprisingly, it turns out that features of solar activity have been related to El Niño and La Niña, also have an significant impact on the NAO. The climate of the Atlantic sector exhibits considerable variability on a wide range of time scales. A substantial portion is associated with the North Atlantic Oscillation (NAO), a hemispheric meridional oscillation as atmospheric mass with centers of action near Iceland and over the subtropical Atlantic. NAO- has a related impacts on winter climate extend from Florida to Greenland and from northwestern Africa over Europe far into northern Asian region. In the present work solar cycle 22 was implemented via sun spots number and area and there interrelationship with NAO index and discussed their dependency which consequently that could be used to predict the behavior of NAO index in the next solar cycle as an indicator to climatic variability. 36. Veretenenko and Ogurtsov, 2016 In this work we study links between low cloud anomalies (LCA) at middle latitudes of the Northern and Southern hemispheres and galactic cosmic ray (GCR) variations used as a proxy of solar variability on the decadal time scale. It was shown that these links are not direct, but realized through GCR/solar activity phenomena influence on the development of extratropical baric systems (cyclones and troughs) which form cloud field. 37. Scafetta et al., 2016 Indeed, many other stable orbital resonance frequencies (e.g. at periods of 20 years, 45 years, 60 years, 85 years, 159–171–185 years) are found in radionucleotide, solar, aurora and climate records, as determined in the scientific literature. Thus, the result supports a planetary theory of solar and/or climate variation that has recently received a renewed attention. In our particular case, the rhythmic contraction and expansion of the solar system driven by a major resonance involving the movements of the four Jovian planets appear to work as a gravitational/electromagnetic pump that increases and decreases the cosmic ray and dust densities inside the inner region of the solar system, which then modulate both the radionucleotide production and climate change by means of a cloud/albedo modulation. 38. Turney et al., 2016 Southern Hemisphere westerly airflow has a significant influence on the ocean–atmosphere system [“precipitation, sea ice extent, sea surface temperatures and the carbon cycle”] of the mid- to high latitudes with potentially global climate implications. … Spectral analysis of the charcoal record identifies a pervasive ca. 250-year periodicity that is coherent with radiocarbon production rates, suggesting that solar variability has a modulating influence on Southern Hemisphere westerly airflow. 39. Baker, 2016 For solar measurements, the first four rows of the matrix predict at least 98% of the top hundred significant periodicities determined from multi-taper spectral analysis of solar data sets (the satellite ACRIM composite irradiance; the terrestrial 10.7cm Penticton Adjusted Daily Radio Flux, Series D; and the historical mean monthly International Sunspot Number). At centennial and millennial time scales, the same matrix predicts ‘average’ significant periodicities (greater than 95%) reported in 23 published climate data sets. This discovery suggests there is strong empirical evidence for a d-cyclic fractional ‘solar clock’, where the corresponding spectrum of cycles and switching events are embedded into the historical, climatic and geological records of the Earth. 40. Liu et al., 2016 Significant relationships were found between our PDSI [Palmer Drought Severity Index] reconstruction and the solar radiation cycle and the sun spot cycle, North Atlantic Oscillation, the El Niño-Southern Oscillation, as well as the Pacific Decadal Oscillation. 41. Engels et al., 2016 Increasing precipitation amounts around 2800 cal. yr BP resulted in a lake-level rise of about 3.5–4 m to levels that were 1–1.5 m higher than at present, in line with increased precipitation levels as inferred for the 2.8-kyr event from nearby raised bog areas as well as with reconstructions of higher lake levels in the French Alps, all of which have been previously attributed to a phase of decreased solar activity. 42. Chen et al., 2016 This reconstruction successfully captured the wetting trend that occurred from the 1980s to the 2000s and generally agreed with dry periods previously estimated from tree-ring records obtained from the surrounding areas. Moreover, a wavelet coherence analysis shows that significant common oscillations (11.5 and 60 yr) have occurred and suggests that precipitation variations across the Urumqi region were related to different climatic forcing mechanisms (i.e. solar activities and the NAO). 43. Luoto and Nevalainen, 2016 Solar and atmospheric forcing on mountain lakes … The influence of NAO and solar forcing on aquatic invertebrates was also significant in the lakes except in the less transparent lake known to have remained uniformly cold during the past centuries due to summertime snowmelt input. The results suggest that external forcing plays an important role in these pristine ecosystems through their impacts on limnology of the lakes. Not only does the air temperature variability influence the communities but also larger-scale external factors related to atmospheric circulation patterns and solar activity cause long-term changes in high-altitude aquatic ecosystems, through their connections to hydroclimatic conditions and light environment. These findings are important in the assessment of climate change impacts on aquatic ecosystems and in greater understanding of the consequences of external forcing on lake ontogeny. 44. Jin et al., 2016 Our record provides further evidence for the complex relationship of insolation [surface solar radiation]-induced temperature, evaporation, and precipitation affecting the regional climate changes on the Tibetan Plateau. 45. Roy, 2016 This work studies the role of natural factors mainly solar eleven-year cycle variability, and volcanic eruptions on two major modes of climate variability the North Atlantic Oscillation (NAO) and El Niño Southern Oscillation (ENSO) for around last 150 years period. The NAO is the primary factor to regulate Central England Temperature (CET) during winter throughout the period, though NAO is impacted differently by other factors in different time periods. Solar variability has a positive influence on NAO during 1978-1997, which is opposite before that period. Solar NAO lag relationship is also sensitive to the chosen times of reference. Such analyses raise a question about previously proposed mechanism and relationship related to the sun and NAO. The ENSO is seen to be influenced strongly by solar variability and volcanic eruptions in certain periods. 46. Jansen et al., 2016 [W]e suggest that deviations in ELA [equilibrium line altitude] fluctuations between Scandinavian maritime and continental glaciers around 7150, 6560, 6000, 5150, 3200 and 2200 cal. yr BP reflect the different response of continental and maritime glaciers to drops in total solar irradiance (TSI). 47. Czymzik et al., 2016 Calcite layer thickness oscillations of about 88 and 208 years resemble the solar Gleissberg and Suess cycles suggesting that the recorded hydroclimate changes in north-eastern Germany are modified by solar influences on synoptic-scale atmospheric circulation. 48. Nagai et al., 2016 The multi-millennial variability recorded in both cores suggests the occurrence of Holocene in-phase climatic changes both in Southern Hemisphere at the latitudes of the SW coast of Brazil (Cabo Frio region) and in the Northern Hemisphere, at the latitude of Galicia (NW Iberian Margin). These coupled climatic alterations were probably related to changes in the oceanic-atmospheric climatic systems, coupled with and amplified by solar forcing effects. 49. Zhang et al., 2016 Our results reveal a persistent wetting trend in northwestern China in winter throughout the Holocene, which is in response to winter insolation [surface solar radiation] at mid-northern latitudes. Winter insolation [surface solar radiation] can influence the rainfall via three ways. First, increasing latitudinal gradient of the incoming solar insolation at mid-latitudes strengthens the westerly intensity. Second, the evaporation is enhanced because of insolation-induced winter temperature rising, resulting in an increase in the air humidity. Intensified westerly winds and the increased water vapour together are conductive to enhance moisture transport towards northwestern China and thus increase winter precipitation in this area. Third, the increasing trend of winter insolation [surface solar radiation] weakens the East Asian winter monsoon, which is favourable for the formation of rainfall via crippling the Siberian High that is beneficial for atmospheric lifting motion. 50. Kuroda, 2016 Climate is known to be affected by various factors, including oceanic changes and volcanic eruptions. 11-year solar cycle change is one of such important factors. Observational analysis shows that the winter-mean North Atlantic Oscillation (NAO) and late-winter/spring Southern Annular Mode (SAM) show structural modulation associated with 11-year solar cycle. In fact, these signals tend to extend from surface to upper stratosphere and persistent longer period only in the High Solar (HS) years. 51. Schulte et al., 2016 Comparing the sedimentary flood proxies from the basins analysed and the Summer NAO index from 1670 to 2000, severe floods occurred mostly during positive SNAO modes. This result is supported by our findings regarding the influence of low-frequency atmospheric circulation pattern on summer floods in Switzerland (1800-2008). Thus, the mechanisms of flood processes from the different catchments are strongly influenced by North Atlantic dynamics and solar forcing. 52. Sánchez et al., 2016 Peatland dynamics seems to have been coupled to changes in solar irradiance and hydrological conditions. Our results point to wetter conditions after the mid-16th century, although with high intra-annual fluctuations. At the late 18th century, when solar activity was systematically higher than before, peat carbon accumulation rates (PCAR) showed a continuous increase and the humification indices suggest a change towards more humified peat. 53. Kodera et al., 2016 The solar signal in the annual mean surface temperature is characterized by (i) mid-latitude warming and (ii) no overall tropical warming. The mid-latitude warming during solar maxima in both hemispheres is associated with a downward penetration of zonal mean zonal wind anomalies from the upper stratosphere during late winter. During the Northern Hemisphere winter this is manifested by a modulation of the polar-night jet, whereas in the Southern Hemisphere, the upper stratospheric subtropical jet plays the major role. Warming signals are particularly apparent over the Eurasian continent and ocean frontal zones, including a previously reported lagged response over the North Atlantic. In the tropics, local warming occurs over the Indian and central Pacific oceans during high solar activity. …. These experiments support earlier evidence of an indirect solar influence [on surface temperatures] from the stratosphere. 54. Berger et al., 2016 This multi-proxy study of a small floodplain in the Rhone catchment area, at the northern edge of the Mediterranean morphoclimatic system, provides valuable information concerning the impact of mid-Holocene climate variability (8.5–7.0 ka) and the effects of two rapid climatic changes (8.2 and 7.7/7.1 ka) on an alluvial plain, its basin and the first farming societies of the Rhone valley. Around 7.7/7.1 ka [7,700/7,100 years ago], the combined effects of (1) a strong rate of change in insolation and (2) variations in solar activity amplified marine and atmospheric circulation in the north-west Atlantic (Bond event 5b), which imply continental hydrological, soil and vegetation changes in the small catchment area. 55. Zhang and Jin, 2016 This paper provides another look at the response of the Asian summer monsoon (ASM) to insolation forcing and oceanic feedback during the Holocene, using a fully coupled general circulation ocean–atmosphere model forced by Earth’s orbital variations. The model results revealed a recurrent circumglobal teleconnection (CGT) pattern in the summertime (June–July–August) mid-latitude circulation of the Northern Hemisphere during the Holocene. The CGT [circumglobal teleconnection] index showed a decreasing trend before ~5 ka BP and a slight increasing trend afterwards, affected by the combined effects of summer insolation, Indian summer monsoon (ISM), North Atlantic and Indian Ocean–western Pacific Ocean sea surface temperature (SST). The CGT showed a close relationship with ASM precipitation and surface air temperature during the Holocene and, therefore, could act as a bridge linking the ASM to insolation, high-latitude forcing (North Atlantic SST), and low-latitude forcing (tropical Ocean SST). 56. Zhu et al., 2016 We identified four major cold periods (1839–1846, 1884–1901, 1906–1908 and 1941–1958) and three major warm periods (1855–1880, 1918–1932 and 1998–2013) in the past 211 years. The multi-taper method spectral analysis revealed significant cycles at 48.8, 11.5, 8.9, 3.9, 3.5 and 2–3 years, which might be associated with global climate oscillations and land-sea thermal contrasts, such as the sea surface temperatures, El Niño-Southern Oscillation, Atlantic Multidecadal Oscillation and solar activity. 57. Wang et al., 2016 Tree-ring-based reconstruction of temperature variability (1445–2011) for the upper reaches of the Heihe River Basin, Northwest China … Spectral analyses suggested that the reconstructed annual mean temperature variation may be related to large-scale atmospheric–oceanic variability such as the solar activity, Pacific Decadal Oscillation (PDO) and El Niño–Southern Oscillation (ENSO). 58. Al-Tameemi and Chukin, 2016 Highlights: Strong correlation between solar activity and the global evaporation rate is detected. … The water cycle is the most active and most important component in the circulation of global mass and energy in the Earth system. Furthermore, water cycle parameters such as evaporation, precipitation, and precipitable water vapour play a major role in global climate change. In this work, we attempt to determine the impact of solar activity on the global water cycle by analyzing the global monthly values of precipitable water vapour, precipitation, and the Solar Modulation Potential in 1983–2008. … The results showed that there is a relationship between the solar modulation potential and evaporation values for the period of study. Therefore, we can assume that the solar activity has an impact on the global water cycle. 59. Ogurtsov et al., 2016 Five proxy temperature time series based on tree-rings and varves from the middle and high latitudes (φ > 50°) of North America were analyzed. They cover the last 3–5 centuries. It was shown that the reconstructions from Canadian Rockies (52.15° N, 117.15° W) and northeast Alaska (68.8° N, 142.3° W) correlate appreciably with Wolf [sunspot] number and 10Be concentration in Greenland ice over long (T > 13 years) time scales. 60. Xiao et al., 2016 The impact of solar activity on tropical Pacific convection during the boreal summer (June-July-August, JJA) has been examined using reanalysis data, revealing a significant lagged (1–2 years) correlation between outgoing long-wave radiation (OLR) over the tropical western Pacific and the F10.7 index. The OLR anomaly over the tropical western Pacific and the maritime continent shows a dipole pattern during the 1–2 years following high solar (HS) years. … By modulating vertical air temperature, the solar signal in the tropical sea surface temperature (SST) may contribute to the triggering of a lagged convection dipole pattern. 61. Bernal et al., 2016 [A]tmospheric circulation over South America and monsoon intensity have been tightly correlated throughout most of the Holocene, both directly responding to solar precession. … We also detect periods where rainfall amount in northeastern and southeastern Brazil are markedly anti-phased, suggesting a north-south migration of SACZ, which it appears to be mediated by solar irradiance. 62. Pedersen et al., 2016 The last interglacial, the Eemian, was characterized by higher than present temperatures in the Arctic region driven by increased summertime insolation [surface solar radiation] at high northern latitudes (CAPE-Last Interglacial Project Members, 2006; MassonDelmotte et al., 2013). The recent NEEM ice core from northwestern Greenland covers the last interglacial period and indicates substantial warming from 129 to 114 thousand years before present (ka) peaking at 8 ± 4 K above the mean of the last millennium. … During the Eemian, the global sea level was increased 6–9 m above present (Dutton and Lambeck, 2012; Dutton et al., 2015; Kopp et al., 2009), indicating a substantial reduction in the continental ice sheets. … [T]he insolation appears to be the dominant cause of the expected ice sheet reduction. 63. Bügelmayer-Blaschek et al., 2016 We performed 19 experiments that differ in the applied forcings (TSI [total solar irradiance], volcanic) and the initial atmospheric conditions. … The fact that also model runs that are not forced with TSI [total solar irradiance] variations display an 80 year time lag indicates that the relationship between TSI [total solar irradiance] and IMF [iceberg melt flux] is due to internal dynamics of the coupled system. From our experiments we conclude that internal ice sheet variability seems to be the source of the multi-century and millennial-scale iceberg events during the Holocene. 64. Cullens et al., 2016 Simulations under both time-varying and fixed-solar inputs show statistically significant responses in temperatures and winds in the Southern Hemisphere (SH) during austral winter and spring. At solar maximum, the monthly-mean, zonal-mean temperature in the SH from July to October is cooler (~1 – 3 K) in the stratosphere and warmer (~1 – 4 K) in the mesosphere and the lower thermosphere (MLT). In solar maximum years, the SH polar vortex is more stable and its eastward speed is about 5 – 8 m s-1 greater than during solar minimum. The increase in the eastward wind propagates downward and poleward from July to October in the SH. Because of increase in the eastward wind, the propagation of eastward gravity waves to the MLT is reduced. This results in a net westward response in gravity wave drag, peaking at ~10 m s-1 day-1 in the SH high-latitude MLT. These changes in gravity wave drag modify the wave-induced residual circulation, and this contributes to the warming of ~1 – 4 K in the MLT. 65. Cabedo-Sanz et al., 2016 Highlights: Periodicities in drift ice potentially associated with volcanic and solar forcing … Abstract: The early mid Holocene (ca 8–6.2 cal ka BP) was characterized by relatively low or absent drift ice, low primary productivity and relatively high SSTs. 66. Kawahata et al., 2016 A long-term trend of declining SSTs can be attributed mainly to changes in solar radiation and sea level and, to a lesser extent, changes in the Asian monsoon. … During the last three millennia, the SSTs (ATs) fluctuated by 2.1 °C, with a maximum in 820 AD (24.3 °C [25.9 °C]) and two minima in 760 BC (22.2 °C [23.8 °C]) and 990 AD (22.4 °C [24.0 °C]). … These temperature fluctuations cannot be explained by a single cause but rather by more than one external and internal driver of climate variability (e.g., volcanic forcing, ocean-atmosphere interactions, and solar forcing). 68. Tang et al., 2016 The thermal structure and energy balance of upper atmosphere are dominated by solar activity. … [T]he results show that the global T-CPM [Temperature of Cold-Point-Mesopause] is significantly correlated to solar activity at the 0.05 level of significance with correlation coefficient of 0.90. … The co-relationship analysis shows that the T-CPM is significantly correlated to solar activity at the 0.05 level of significance for each latitude zone. The correlation coefficients at middle latitude regions are higher than those of equator and high latitude regions, and the global distribution takes on M-shape. 69. Sunkara and Tiwari, 2016 To study the imprints of the solar–ENSO–geomagnetic activity on the Indian subcontinent, we have applied singular spectral analysis (SSA) and wavelet analysis to the tree-ring temperature variability record from the Western Himalayas. Other data used in the present study are the solar sunspot number (SSN), geomagnetic indices (aa index), and the Southern Oscillation Index (SOI) for the common time period of 1876–2000. Both SSA and wavelet spectral analyses reveal the presence of 5–7-year short-term ENSO variations and the 11-year solar cycle, indicating the possible combined influences of solar–geomagnetic activities and ENSO on the Indian temperature. Another prominent signal corresponding to 33-year periodicity in the tree-ring record suggests the Sun-temperature variability link probably induced by changes in the basic state of the Earth’s atmosphere. In order to complement the above findings, we performed a wavelet analysis of SSA reconstructed time series, which agrees well with our earlier results and increases the signal-to-noise ratio, thereby showing the strong influence of solar–geomagnetic activity and ENSO throughout the entire period. … The present analyses suggest that the influence of solar activities on the Indian temperature variability operates in part indirectly through coupling of ENSO on multilateral timescales. 70. Usoskin et al., 2016 The corrected series is provided as supplementary material in electronic form and displays secular minima around 1800 (Dalton Minimum) and 1900 (Gleissberg Minimum), as well as the Modern Grand Maximum of activity in the second half of the twentieth century. The uniqueness of the grand maximum is confirmed for the last 250 years. 71. Sha et al., 2016 Solar forcing as an important trigger for West Greenland sea-ice variability over the last millennium … Here, we use diatom assemblages from a marine sediment core collected from the West Greenland shelf to reconstruct changes in sea-ice cover over the last millennium. The proxy-based reconstruction demonstrates a generally strong link between changes in sea-ice cover and solar variability during the last millennium. Weaker (or stronger) solar forcing may result in the increase (or decrease) in sea-ice cover west of Greenland. In addition, model simulations show that variations in solar activity not only affect local sea-ice formation, but also control the sea-ice transport from the Arctic Ocean through a sea-ice–ocean–atmosphere feedback mechanism. 72. Muthers et al., 2016 The influence of reduced solar forcing (grand solar minimum or geoengineering scenarios like solar radiation management) on the Atlantic meridional overturning circulation (AMOC) is assessed in an ensemble of atmosphere-oceanchemistry-climate model simulations. Ensemble sensitivity simulations are performed with and without interactive chemistry. Without chemistry-climate interaction the AMOC is intensified in the course of the solar radiation reduction (SRR), which is attributed to the thermal effect of the solar forcing: reduced sea surface temperatures and enhanced sea ice formation increase the density of the upper ocean in the North Atlantic and intensify the deepwater formation. In simulations with chemistry-climate interactions a second, dynamical effect on the AMOC is identified which counteracts the thermal effect. This dynamical mechanism is driven by the stratospheric cooling in response to the reduced solar forcing, which is strongest in the tropics and leads to a weakening of the Northern polar vortex. 73. Roy et al., 2016 Introduction: Observational studies have suggested a significant solar related impact on sea surface temperatures in the tropical Pacific (van Loon et al., 2007, Meehl et al., 2008), tropical circulations (Haigh et al., 2005, Meehl et al., 2008), climatological precipitation maxima in the tropics (van Loon et al., 2004), Northern Hemisphere winter blocking (Barriopedro et al., 2008; Lockwood et al., 2010), North Atlantic Oscillation (NAO) (Lockwood et al., 2010, Maliniemi et al., 2013, 2014), Northern Annular Mode (NAM) (Ogi et al., 2004) and Antarctic polar vortex (Haigh and Roscoe, 2009). 74. Agnihotri, 2016 Summary and Recommendations: With increasing evidences from both continental (such as aforementioned examples of climate manifestations) as well as oceanic repositories [Agnihotri et al., 2002 & 2008; Kurian et al., 2009] from both hemispheres (i.e. northern as well as southern hemispheres), it is becoming clear that variations in Sun’s energy output despite being quantitatively very minute, appears to be capable of influencing terrestrial climate on decadal to centennial timescales, most likely due to involvement of certain key ocean-atmospheric feedback processes [Agnihotri & Dutta, 2003; Kodera, 2004; Ruzmaikin, 2007]. Exact causal mechanism(s) involved and necessary amplifying agents are still to be identified and understood in order to quantify role of this external forcing of climate. 75. Eicher, 2016 Climatic and insolation [surface solar radiation] control on the high-resolution total air content in the NGRIP ice core … Here we present a highresolution TAC record over the whole North Greenland Ice Core Project ice core, covering the last 120 000 years, which independently supports an insolation signature in Greenland. Wavelet analysis reveals a clear precession and obliquity signal similar to previous findings on Antarctic TAC, with a different insolation history. 76. Sen and Ogrin, 2016 This paper investigates the monthly, winter, and annual temperature time series obtained from the instrumental records in Zagreb, Croatia, for the period 1864–2010. Using wavelet analysis, the dominant modes of variability in these temperature series are identified, and the time intervals over which these modes may persist are delineated. The results reveal that all three temperature records exhibit low frequency variability with a dominant periodicity at around 7.7 years. The 7.7-year cycle has also been observed in the temperature data recorded at several other stations in Europe, especially in Northern and Western Europe, and may be linked to the North Atlantic Oscillation (NAO) and/or solar/geomagnetic activity. 77. Maruyama, 2016 The interest in the relation between the solar activity and climate change is increasing. As for the solar activity, a fractal property of the sunspot series was studied by many works. In general, a fractal property was observed in the time series of dynamics of complex systems. The purposes of this study were to investigate the relationship between the sunspot number, solar radio flux at 10.7 cm (F10.7 cm) and total ozone from a view of multifractality. … The influence of the solar activity on the total ozone was shown by the wavelet coherence, phase and the similarity of the change of fractality. These findings will contribute to the research of the relationship between the solar activity and climate. 78. Poulos, 2016 The physical mechanism proposed is that planetary gravitational forces drive solar activity that in turn drives temperature variations in earth. The sun is in a boundary balance state at one hand collapsing due to gravity and at the other hand expanding due to fusion, and as such it should be heavily influenced by minimal external forcings such as planetary gravity. Sound waves in the solar mass, created from the planetary movement, are responsible for the formation of solar corona and sun spots. The Earth-Venus 251 year resonance is resonant to a near surface solar layer’s thermal natural frequency that “explodes” to form solar wind. The calculated solar wind properties match the observed. 79. Maliniemi, 2016 Observations of solar wind related climate effects in the Northern Hemisphere winter … Recent results, both observational and from chemistry climate models, have indicated significant effects in the Earth’s middle atmosphere due to the energetic electrons precipitating from the magnetosphere. These effects include the formation of reactive hydrogen and nitrogen oxides in the high latitude mesosphere and the depletion of ozone caused by them. Ozone is a radiatively active and important gas, which affects the thermal structure and dynamics of the middle atmosphere. Accordingly, the depletion of ozone can intensify the large scale stratospheric circulation pattern called the polar vortex. Winter weather conditions on the surface have been shown to be dependent on the polar vortex strength. … A comprehensive knowledge of the Earth’s climate system and all its drivers is crucial for the future projection of climate. Solar variability effects have been estimated to produce only a small factor to the global climate change. However, there is increasing evidence, including the results presented in this thesis, that the different forms of solar variability can have a substantial effect to regional and seasonal climate variability. With this new evidence, the solar wind related particle effects in the atmosphere are now gaining increasing attention. These effects will soon be included in the next coupled model inter comparison project (CMIP6) as an additional solar related climate effect. 80. Muthers et al., 2016 The influence of reduced solar forcing (grand solar minimum or geoengineering scenarios like solar radiation management) on the Atlantic Meridional Overturning Circulation (AMOC) is assessed in an ensemble of atmosphere–ocean–chemistry–climate model simulations. Ensemble sensitivity simulations are performed with and without interactive chemistry. In both experiments the AMOC is intensified in the course of the solar radiation reduction, which is attributed to the thermal effect of the solar forcing: reduced sea surface temperatures and enhanced sea ice formation increase the density of the upper ocean in the North Atlantic and intensify the deepwater formation. Furthermore, a second, dynamical effect on the AMOC is identified driven by the stratospheric cooling in response to the reduced solar forcing. 81. Sanchez-Lorenzo et al., 2016 The linear trend in the mean annual series of global solar radiation shows a significant increase since the 1980s of around 10 Wm-2 over the whole 32-year study period. Similar significant increases are observed in the mean seasonal series, with the highest rate of absolute (relative) change during summer (autumn). These results are in line with the widespread increase of global solar radiation, also known as the brightening period, reported at many worldwide observation sites (e.g. Wild, 2009; Sanchez-Lorenzo et al., 2013b). … Summarizing, all these results point towards a diminution of clouds and/or aerosols in Spain since the 1980s. 82. Kambezidis et al., 2016 [T]his work investigates the evolution and trends in the surface net short-wave radiation (NSWR, surface solar radiation – reflected) over the Mediterranean Basin during the period 1979 − 2012 using monthly re-analysis datasets from the Modern Era Retrospective-Analysis for Research and Applications (MERRA) and aims to shed light on the specific role of clouds on the NSWR trends. The solar dimming/brightening phenomenon is temporally and spatially analyzed over the Mediterranean Basin. The spatially-averaged NSWR over the whole Mediterranean Basin was found to increase in MERRA by +0.36 Wm−2 per decade, with higher rates over the western Mediterranean (+0.82 Wm−2 per decade), and especially during spring (March-April-May; +1.3 Wm−2 per decade). … The increasing trends in NSWR are mostly associated with decreasing ones in cloud optical depth (COD), especially for the low (<700 hPa) clouds. The decreasing COD trends (less opaque clouds and/or decrease in absolute cloudiness) are more pronounced during spring, thus controlling the increasing tendency in NSWR. 83. Calbó et al., 2016 The present paper describes how the entire series of global solar radiation (1987–2014) and diffuse radiation (1994–2014) were built, including the quality control process. Appropriate corrections to the diffuse component were made when a shadowband was employed to make measurements. Analysis of the series reveals that annual mean global irradiance presents a statistically significant increase of 2.5 W m−2 (1.4 %) decade−1 (1988–2014 period), mainly due to what occurs in summer (5.6 W m−2 decade−1). These results constitute the first assessment of solar radiation trends for the northeastern region of the Iberian Peninsula and are consistent with trends observed in the regional surroundings and also by satellite platforms, in agreement with the global brightening phenomenon. Diffuse radiation has decreased at −1.3 W m−2 (−2 %) decade−1 (1994–2014 period), which is a further indication of the reduced cloudiness and/or aerosol load causing the changes. 84. Andres, 2016 Reconstructions of historical climate changes indicate that surface air temperatures decreased over the preindustrial last millennium. Conflicting explanations have been proposed for the cause of the transition from the Medieval Climate Anomaly (MCA) in the early part of the last millennium to the Little Ice Age (LIA) near its end. The possible causes include volcanic emissions, total solar irradiance (TSI) variations, greenhouse gas concentration fluctuations and orbital forcing variations. In the present paper, we demonstrate that all of these climate forcings contribute significantly to simulated surface air temperature and sea ice concentration changes over this period. On the other hand, simulated ocean heat content appears to respond significantly only to volcanic and TSI [total solar irradiance] variations. In simulations at T85 resolution, TSI [total solar irradiance] reductions and volcanic emissions together generate significant increases in sea ice extent in the Barents Sea, which we find to be responsible for most of the temperature reductions over north-western Europe. 85. Xing et al., 2016 The comparison between MDVM reconstructed temperature and the variation of external forcing (solar activity and volcanic activity) is shown in Fig. 5. 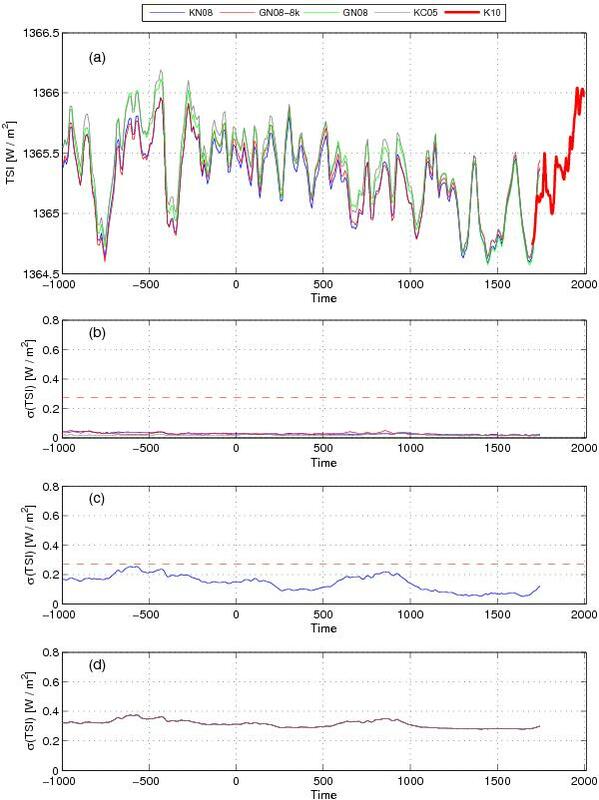 The smoothed MDVM reconstruction exhibited a general agreement with the variation of the reconstructed total solar irradiance (TSI), and the correlation between the two series during the common period 849–2000 AD was significant (r = 0.498, edf = 34, p<0.01). Specially, the records shared high correlation coefficients in the epochs of the solar maximum (i.e. during the Medieval and Modern age), but poor correlation around 1500–1700 AD when the Spörer Minimum and Maunder Minimum occurred. It was similar to some other dendrochronological researches concerning the relation with solar activity. The relatively cold conditions between the two warm peaks around AD 1000 and 1100 seemed to be related to the Oort Minimum. …. Therefore, the temperature reconstructions based on the MDVM method agreed well in general with the characteristic variations of the solar and volcanic forcings. … It was also reported that the abrupt onset of the LIA was likely triggered by a succession of strong volcanic eruptions and sustained by sea-ice/ocean feedbacks. According to mainstream opinions, the LIA type events were probably attributed to a combination of solar minima and volcanic eruptions. 86. Voarintsoa et al., 2016 Multiple proxies … from Dante Cave [southwestern Africa] indicate a linkage between changes in hydroclimate in northeastern Namibia and changes in solar activity and changes in global temperatures. The record suggests that during solar minima and globally cooler conditions (ca. 1660–1710 and ca. 1790–1830 [Little Ice Age]), wetter periods (reflecting longer summer seasons) in northeastern Namibia were linked to advances of the Inter-Tropical Convergence Zone (ITCZ) and the Inter-Ocean Convergence Zone (IOCZ) southwestward. 87. Chambers, 2016 The so-called ‘Little Ice Age’ (LIA) of the 15th–19th centuries [1400-1900 AD] is a fascinating period of time, for many reasons. Extensive reading of the literature on the topic can reveal the following: (1) in many (but not all) proxy-climate reconstructions, it is shown as having a fast and strong onset (O’Brien et al., 1995), exceeded in the Holocene perhaps only by the 8.2ka event (Mayewski et al., 2004); (2) it includes evidence for glacier re-advance – in northern Europe, particularly, to positions not otherwise (or seldom) reached within the mid–late Holocene (McCarroll, 1991; Matthews and Shakesby, 1984; Nesje, 2009); (3) it follows the Medieval Climate Anomaly (MCA) and precedes the period of recent ‘Global Warming’, and therefore, it post-dates the Medieval Solar Maximum, encompasses up to three solar minima (Spörer, Maunder and Dalton) (Grove, 1988), and precedes the ‘Contemporary’ (namely, late 20th century) Solar Maximum (Hoyt and Schatten, 1997; Pan and Yau, 2002); (4) there are multiple hypotheses as to the cause of its onset (cf. Miller et al., 2012), although it is widely considered that reduced solar activity is the cause of at least its most intense phases (cf. Mauquoy et al., 2002) …. (12) recent work implies an in-phase relationship between the Southern and Northern Hemispheres [the Little Ice Age was a global event] (Chambers et al., 2014; Simms et al., 2012). 88. Sanchez-Lopez et al., 2016 The dominant warm and arid conditions during the MCA [Medieval Climate Anomaly, 900-1300 CE], and the cold and wet conditions during the LIA [Little Ice Age, 1300-1850 CE] indicate the interplay of the NAO+, EA+ and NAO- , EA- [positive/negative North Atlantic Oscillation, East Atlantic phases], respectively. Furthermore, the higher solar irradiance during the [“warm conditions”] RP [Roman Period, 200 BCE – 500 CE] and MCA [Medieval Climate Anomaly, 900-1300 CE] may support the predominance of the EA+ [positive East Atlantic] phase, whereas the opposite scenario [“colder temperatures”] during the EMA [Early Middle Age, 500-900 CE] and LIA [Little Ice Age, 1300-1850 CE] may support the predominance of the EA- [negative East Atlantic] phase, which would favour the occurrence of frequent and persistent blocking events in the Atlantic region during these periods. 89. Bauchi Danladi and Akçer-Ön, 2016 Due to the variability of the Little Ice Age (LIA) and Medieval Climatic Anomaly (MCA), several climatic forcing mechanisms have been invoked to enlighten the issue. The focus of this study is on the influence of the solar activity proxy (Total Solar Irradiance) during the LIA and MCA in a high altitude Lake Salda in south-western Anatolia. … [T]he sediment records cover the last millennium. We have observed the effect of the solar activity throughout the LIA and MCA in Lake Salda, with wet and dry spells corresponding to high and low TSI [total solar irradiance] respectively. In addition, the Dalton Minimum, Maunder Minimum, Spörer Minimum, Wolf Minimum, the Medieval Maximum and the Oort Minimum have been observed. 90. Li et al., 2016 Our results support the view that over the past millennium, on a multi-centennial timescale, the moisture variations in ACA [arid Central Asia] were generally out-of-phase with those in the region affected by the Asian summer monsoon. The humid, unstable LIA [Little Ice Age] climate in ACA [arid Central Asia] may have been associated with changes in the North Atlantic Oscillation (NAO) index and/or with variations in solar irradiance. 91. Guo et al., 2016 A regional synthesis of the palaeoflood chronology over the last 3000 years was compiled along the middle Yangtze River. Extraordinary flood events generally seem to be correlated with late Holocene climatic variability (i.e. Neoglacial cooling, Roman Warm Period, Dark Ages Cold Period, Medieval Climate Anomaly, and Little Ice Age). The high-resolution climatic proxies from stalagmites of the Dongge cave and Heshang cave, ice-cores of the GRIP, the total solar irradiance variations and sunspot number, and ENSO activities suggest that these hydroclimatic events are possibly related to the weaker Asia summer monsoon and the cooling climatic events, as well as the stronger ENSO activities during the late Holocene in the Yangtze River valley. These results provide insights into the response of hydroclimatic system to global change in the large rivers of Asia. 92. Miettinen et al., 2016 The results demonstrate both abrupt changes and a clear centennial-bicentennial variability for the last millennium. The Medieval Climate Anomaly (MCA) between 1000 and 1200 CE represents the warmest ocean surface conditions of the SE Greenland shelf over the late Holocene (880 BCE-1910 CE). MCA in the current record is characterized by abrupt, decadal to multidecadal changes, such as an abrupt warming of ~2.4 °C in 55 years around 1000 CE. Temperature changes of these magnitudes are rarely observed in other proxy records from the North Atlantic. … A cool phase, from 1200-1890 CE, associated with the Little Ice Age (LIA), ends with the rapid warming of aSST and diminished aSIC in the early 20th century. The phases of warm aSST and aSIC minima on the SE Greenland shelf and solar minima of the last millennium are antiphased, suggesting that solar forcing possibly amplified by atmospheric forcing has been behind the aSST variability on the SE Greenland over the last millennium. 93. Zhu et al., 2016 During the period 1875–1955, late summer temperature fluctuated less strongly than before or thereafter. In general, the average length of cold periods was shorter than that of warm periods. The cold period of 1869–1877 was the longest and coldest cool period had a mean of 17.63°C. The longest warm period extended from 1655 to 1668, and the warmest period in AD 1719–1730 had a mean of 20.37°C. However, we should point out that the rapid warming during the 20th century was not especially obvious in our reconstructed RLST. … [S]even cold periods and three warm periods were identified during the past 368 years (Fig. 4d). All the cold periods were during the Maunder (1708–1711) or Dalton (1818– 1821, 1824–1828, 1832–1836, and 1839–1842) solar minima periods, except for the cold periods of 1765–1769 and 1869–1877 (Eddy, 1976; Shindell et al., 1999), which indicated that RLST [mean maximum temperature] variations in the NWSP [northwestern Sichuan Plateau, China ] might be driven by solar activity (Fig. 7b). On the other hand, volcanic eruptions in the corresponding periods might also be a cooling factor (Fig. 7b). A longer cold period (e.g., 1820s–1840s) was interrupted by transient warming, thus forming a plurality of discontinuous short cold periods. Warm periods of 1719–1730 and 1858–1859 both had more sunspots (Eddy, 1976; Shindell et al., 1999) and lower volcanic forcing (Fig. 7b). The cold (1765–1769 or 1869–1877) and warm (1655–1668) periods were highly consistent with other studies (Fig. 7). … Accompanied by significant peaks at 60.2 and 73 years, the continuously periodicities around 49–114 years in our regional temperature reconstruction might tentatively be related to PDO, Atlantic Multidecadal Oscillation (AMO; En- field et al., 2001) as well as solar activity (Eddy, 1976; Shindell et al., 1999; Peristykh and Damon, 2003; Raspopov et al., 2004; Braun et al., 2005). … [S]ignificant multidecadal- and centennial-scale cycles of our temperature reconstruction might include the signs of solar activity, such as the Gleissberg cycles (Peristykh and Damon, 2003), Suess cycles (Braun et al., 2005), Bruckner cycles (Raspopov et al., 2004), and Schwabe cycles (Braun et al., 2005). The Maunder (ca. AD 1645–1715) and Dalton (ca. AD 1790–1840) solar minima periods were generally associated with temperature depressions (Eddy, 1976), and the Damon (ca. AD 1890– 1920) solar maximum period occurred in a relatively warm period, which further confirmed that late summer temperature variation in the NWSP [northwestern Sichuan Plateau, China ] might be driven by solar activity (Fig. 7b). … Conclusion: Overall, the RLST [mean maximum temperature] variability in the NWSP [northwestern Sichuan Plateau, China ] might be associated with global land–sea atmospheric circulation (e.g., ENSO, PDO, or AMO) as well as solar and volcanic forcing. 94. Lyu et al., 2016 The reconstructed April–July MMT series exhibited six cold and seven warm periods. The longest cold period lasted from AD 1645 to 1677 (33 years), with an average temperature of 0.5 ◦C below the mean value. The longest warm period, however, lasted from AD 1767 to 1785 (19 years), and the average temperature was 0.69 ◦C above the mean value (Table 4). Four cold (1605–1616, 1645–1677, 1911–1924, and 1951–1969) and warm (1795–1807, 1838– 1848, 1856–1873, and 1991–2008) periods were consistent with other results of tree-ring reconstructions in northeast China (Shao and Wu, 1997; Yin et al., 2009; Wang et al., 2012; Zhu et al., 2015). In addition, two cold periods (1645– 1677 and 1684–1691) were consistent with the Maunder Minimum (1645–1715), an interval of decreased solar irradiance (Bard et al., 2000). … The three temperature series exhibited significantly low temperature periods during the 1950s–1970s, which coincided with a slight decrease in solar activity from AD 1940 to 1970 (Beer et al., 2000; Fig. 7). 95. Hanna, 2016 Temperature reconstructions from Simpson Lagoon also show similarities with regional and pan-Arctic climate records over the last few millennia, with evidence of temperature departures correlative with noted climate events (i.e., Little Ice Age, Medieval Climate Anomaly). … This paleoclimate variability may be driven by variations in solar output and/or shifts in the regional ocean-atmosphere circulation patterns (e.g., the Aleutian Low). 96. Abdussamatov, 2016 The quasi-centennial epoch of the new Little Ice Age has started at the end 2015 after the maximum phase of solar cycle 24. The start of a solar grand minimum is anticipated in solar cycle 27 ± 1 in 2043 ± 11 and the beginning of phase of deep cooling in the new Little Ice Age in 2060 ± 11. The gradual weakening of the Gulf Stream leads to stronger cooling in the zone of its action in western Europe and the eastern parts of the United States and Canada. Quasi-bicentennial cyclic variations of TSI together with successive very important influences of the causal feedback effects are the main fundamental causes of corresponding alternations in climate variation from warming to the Little Ice Age. 97. Yndestad and Solheim, 2016 In 1890´s G. Spörer and E. W. Maunder (1890) reported that the solar activity stopped in a period of 70 years from 1645 to 1715. Later a reconstruction of the solar activity confirms the grand minima Maunder (1640-1720), Spörer (1390-1550), Wolf (1270-1340), and the minima Oort (1010-1070) and Dalton (1785-1810) since the year 1000 A.D. (Usoskin et al. 2007). These minimum periods have been associated with less irradiation from the Sun and cold climate periods on Earth. An identification of a three grand Maunder type periods and two Dalton type periods in a period thousand years, indicates that sooner or later there will be a colder climate on Earth from a new Maunder- or Dalton- type period. …. The result shows that the TSI variability and the sunspots variability have deterministic oscillations, controlled by the large planets Jupiter, Uranus and Neptune, as the first cause. 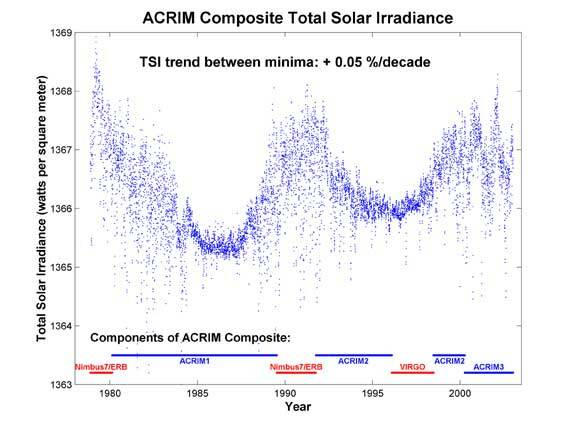 A deterministic model of TSI [total solar irradiance] variability and sunspot variability confirms the known minimum and grand minimum periods since 1000. From this deterministic model we may expect a new Maunder type sunspot minimum period from about 2018 to 2055. The deterministic model of a TSI ACRIM data series from 1700 computes a new Maunder type grand minimum period from 2015 to 2071. A model of the longer TSI ACRIM data series from 1000 computes a new Dalton to Maunder type minimum irradiation period from 2047 to 2068. 98. Torres and Guzmán, 2016 Based on our results, we propose the use of the Wolf’s Number Oscillation Index (WNOI) – as a more uniform alternative to the ONI – in the range over 30 and below -30. The analysis of the material presented and the arguments discussed allows us to define a possible relationship between phenomena related to Solar Cycle, the ENSO, climatic conditions, as well as some criteria for the establishment of public policies for preservation and remediation of the environment in the long run. We can conclude that solar activity oscillations impact the earth climatic conditions to such a extent that they become measurable only in the long run. The magnitude of the Solar Cycle – from 7 to 17 and a mean of 11.2 years – seems to support this statement. Based on the similarities of the Solar Cycles 5 and 24 we can expect a longer period of cold weather for the years 2022 y/o 2034, corresponding to the Solar Cycles 24 and 25. 99. Chiodo et al., 2016 Solar variability represents a source of uncertainty in the future forcings used in climate model simulations. Current knowledge indicates that a descent of solar activity into an extended minimum state is a possible scenario. With aid of experiments from a state-of-the-art Earth system model, we investigate the impact of a future solar minimum on Northern Hemisphere climate change projections. This scenario is constructed from recent 11 year solar-cycle minima of the solar spectral irradiance, and is therefore more conservative than the ‘grand’ minima employed in some previous modeling studies. Despite the small reduction in total solar irradiance (0.36 W m−2), relatively large responses emerge in the winter Northern Hemisphere, with a reduction in regional-scale projected warming by up to 40%. To identify the origin of the enhanced regional signals, we assess the role of the different mechanisms by performing additional experiments forced only by irradiance changes at different wavelengths of the solar spectrum. We find that a reduction in visible irradiance drives changes in the stationary wave pattern of the North Pacific and sea–ice cover. A decrease in UV irradiance leads to smaller surface signals, although its regional effects are not negligible. These results point to a distinct but additive role of UV and visible irradiance in the Earth’s climate, and stress the need to account for solar forcing as a source of uncertainty in regional scale projections. 100. Sanchez-Sesma, 2016 This empirical modeling of solar recurrent patterns has also provided a consequent multi-millennial-scale experimental forecast, suggesting a solar decreasing trend toward grand (super) minimum conditions for the upcoming period, AD 2050–2250 (AD 3750–4450). … Solar activity (SA) has non-linear characteristics that influence multiple scales in solar processes (Vlahos and Georgoulis, 2004). For instance, millennia-scale solar oscillations have been recently detected, like those of about 6000 and 2400 years, by Xapsos and Burke (2009) and Charvátová (2000), respectively, with important and interesting influences in the near, past and future climate. These millennialscale patterns of reconstructed SA variability could justify epochs of low activity, such as the Maunder minimum, as well as epochs of enhanced activity, such as the current Modern Maximum, and the Medieval maximum in the 12th century. … We can conclude that the evidence provided is sufficient to justify a complete updating and reviewing of present climate models to better consider these detected natural recurrences and lags in solar processes. 101. Camenisch et al., 2016 Climate reconstructions from a multitude of natural and human archives indicate that, during winter, the period of the early Spörer Minimum (1431–1440 CE) was the coldest decade in Central Europe in the 15th century. The particularly cold winters and normal but wet summers resulted in a strong seasonal cycle that challenged food production and led to increasing food prices, a subsistence crisis, and a famine in parts of Europe. As a consequence, authorities implemented adaptation measures, such as the installation of grain storage capacities, in order to be prepared for future events. The 15th century is characterised by a grand solar minimum and enhanced volcanic activity, which both imply a reduction of seasonality. 102. Chae and Park, 2016 We present a multi-proxy record (pollen, microscopic charcoal, carbon-isotopic composition [δ13C], organic content, and particle size) of the late-Holocene climate change and human impact from central-eastern South Korea. The Medieval Climate Anomaly (MCA) and Little Ice Age (LIA), the most recent major climate events, have not been accurately investigated by paleolimnological studies in Korea, mainly due to a lack of undisturbed sediments and indifference to the past climate change. Our pollen records show late- Holocene centennial climate variations characterized by the successive solar minimums of the Oort, Wolf, Spörer, Maunder, and Dalton. We find paleoenvironmental evidence for shifting cultivation associated with serious droughts and consequent famines during the early 19th-century Dalton minimum. Our interpretation of human activities is well supported by Korean historical documents describing socioeconomic suffering induced by LIA climate deteriorations. 103. Büntgen et al., 2016 Climatic changes during the first half of the Common Era have been suggested to play a role in societal reorganizations in Europe and Asia. In particular, the sixth century coincides with rising and falling civilizations, pandemics, human migration and political turmoil. Our understanding of the magnitude and spatial extent as well as the possible causes and concurrences of climate change during this period is, however, still limited. Here we use tree-ring chronologies from the Russian Altai and European Alps to reconstruct summer temperatures over the past two millennia. We find an unprecedented, long-lasting and spatially synchronized cooling following a cluster of large volcanic eruptions in 536, 540 and 547 AD, which was probably sustained by ocean and sea-ice feedbacks, as well as a solar minimum. We thus identify the interval from 536 to about 660 AD as the Late Antique Little Ice Age. Spanning most of the Northern Hemisphere, we suggest that this cold phase be considered as an additional environmental factor contributing to the establishment of the Justinian plague, transformation of the eastern Roman Empire and collapse of the Sasanian Empire, movements out of the Asian steppe and Arabian Peninsula, spread of Slavic-speaking peoples and political upheavals in China. 104. Katsuki et al., 2016 [W]e reconstructed the history of typhoon and storm-rain activity only for the interval AD 1400–1900. The record indicates that typhoon frequency throughout the Korean Peninsula varied in response to the state of the El Niño/Southern Oscillation. Typhoon variability was likely modulated further by the state of the East Asia summer monsoon (EASM) pattern, associated with variation in the magnitude of solar irradiance. During periods of minimum solar activity, such as the early Maunder Minimum (AD 1650–1675), typhoons struck the east China coast and Korean Peninsula more frequently because of a strengthened EASM. 105. Gogou et al., 2016 We provide new evidence on sea surface temperature (SST) variations and paleoceanographic/paleoenvironmental changes over the past 1500 years for the north Aegean Sea (NE Mediterranean). The reconstructions are based on multiproxy analyses, obtained from the high resolution (decadal to multi-decadal) marine record M2 retrieved from the Athos basin. Reconstructed SSTs show an increase from ca. 850 to 950 AD and from ca. 1100 to 1300 AD. A cooling phase of almost 1.5°C is observed from ca. 1600 AD to 1700 AD. This seems to have been the starting point of a continuous SST warming trend until the end of the reconstructed period, interrupted by two prominent cooling events at 1832 ± 15 AD and 1995 ± 1 AD. … Internal variability in atmospheric/oceanic circulations systems as well as external forcing as solar radiation and volcanic activity could have affected temperature variations in the north Aegean Sea over the past 1500 years. … The paleoclimatic evidence derived from the M2 record is combined with a socio-environmental study of the history of the north Aegean region. We show that the cultivation of temperature-sensitive crops, i.e. walnut, vine and olive, co-occurred with stable and warmer temperatures, while its end coincided with a significant episode of cooler temperatures. Periods of agricultural growth in Macedonia coincide with periods of warmer and more stable SSTs, but further exploration is required in order to identify the causal links behind the observed phenomena. The Black Death likely caused major changes in agricultural activity in the north Aegean region, as reflected in the pollen data from land sites of Macedonia and the M2 proxy-reconstructions. Finally, we conclude that the early modern peaks in mountain vegetation in the Rhodope and Macedonia highlands, visible also in the M2 record, were very likely climate-driven. 106. Stockhecke et al., 2016 Millennial to orbital-scale rainfall changes in the Mediterranean region and corresponding variations in vegetation patterns were the result of large-scale atmospheric reorganizations. In spite of recent efforts to reconstruct this variability using a range of proxy archives, the underlying physical mechanisms have remained elusive. Through the analysis of a new high-resolution sedimentary section from Lake Van (Turkey) along with climate modeling experiments, we identify massive droughts in the Eastern Mediterranean for the past four glacial cycles, which have a pervasive link with known intervals of enhanced North Atlantic glacial iceberg calving, weaker Atlantic Meridional Overturning Circulation and Dansgaard-Oeschger cold conditions. On orbital timescales, the topographic effect of large Northern Hemisphere ice sheets and periods with minimum insolation [low solar activity] seasonality further exacerbated drought intensities by suppressing both summer and winter precipitation. 107. Kaniewski et al., 2016 Solar pacing of storm surges, coastal flooding and agricultural losses in the Central Mediterranean … Storm surges, leading to catastrophic coastal flooding, are amongst the most feared natural hazards due to the high population densities and economic importance of littoral areas. Using the Central Mediterranean Sea as a model system, we provide strong evidence for enhanced periods of storminess leading to coastal flooding during the last 4500 years. We show that long-term correlations can be drawn between storminess and solar activity, acting on cycles of around 2200-yr and 230-yr. We also find that phases of increased storms and coastal flooding have impacted upon mid- to late Holocene agricultural activity on the Adriatic coast. Based on the general trend observed during the second half of the 20th century, climate models are predicting a weakening of Mediterranean storminess. By contrast, our new data suggest that a decrease in solar activity will increase and intensify the risk of frequent flooding in coastal areas. Bonne chance Dr Tim Ball. I am with you. And I can feel the several thousands other scientists whishing you good luck, even though they can’t speak or officially tell you publicly. Soon, all this will be possible. Contrast and compare the level of research and its quality to that done on Arctic ice volume. Where are the records for the amount of Arctic ice over the centuries? Ice records that could prove Hansen’s assumption that Arctic sea ice is a good proxy for indicating global temperature trends. Since when did local temperature effects, both atmospheric and oceanic, on ice volumes become an indicator of global temperatures? Where are the studies and research attempting to prove Arctic ice amounts vary directly with global temperatures? Alternatively research on solar effects on the planet’s climate is conclusive. The sun runs the earth’s climate show. CO2 has less than a bit part to play. Despite all protestation from AGW propagandists, to the contrary there is no observed warming from this rare atmospheric gas, in the locale where we live. The sun’s radiation on to this planet’s surfaces runs the show. Despite all protestation from AGW propagandists, to the contrary there is no observed warming from this rare atmospheric gas, in the locale where we live. Considering the heat capacity of the ocean is 1,000 times greater than the air, and that it is claimed that it’s the radiative balance/imbalance at the TOA that determines whether the climate system warms or cools on a net decadal/centennial scale, the key question then becomes whether or not global-scale ocean heat content (not surface air temperature) has been observed over the long-term to have varied in response to CO2 forcing. It hasn’t. Even if there was a correlation in the “observed” record, the uncertainty in ocean data is so large as to completely overwhelm the alleged (tiny) W m-2 response of the climate system to CO2 forcing. Not only that, but there have been no scientific experiments or physical measurements that have shown CO2 variations in volumes of parts per million (0.000001) are capable of heating water — not to mention that infrared heat can penetrate to ocean depths of 1,000s of meters (it can’t). 1) Incoming solar irradiance has been decreasing since 1958 – and especially during the last 20 years. 2) The earth has been warming up during this period with multiple new warmth records over the last 20 years. 3) Atmospheric greenhouse gases (and in particular – carbon dioxide) have been increasing since 1958. The earth’s temperature is responding to increased greenhouse gases and not responding to solar influences. But perhaps you can answer this question, Bill. Between the warmer-than-now Medieval Warm Period (900-1200 CE) and about 1900, ocean (and global) temperatures plummeted. During this same period, CO2 concentrations slowly but steadily increased. So what was the cause of the plummeting temperatures? Why did the heat energy in the global oceans decline so dramatically? CO2 variations are anti-correlated with the temperature fluctuation (temperatures declined while CO2 rose). So what was the forcing mechanism behind the 14th-19th century Little Ice Age cooling, since it wasn’t CO2? Please provide detailed answers to the above questions, citing scientific papers when possible. I posted on this recently. Here’s a visual of that. Notice the correlation between the Modern Grand Maximum of solar activity (1940-present) and the surface temperature. I may get back to you with questions on some related material, but no time right now. Terrific work you are doing. Thanks Bill, for showing everybody that solar cycle 19 was the HIGHEST in at least 200 year.. Further reading would show that it was the highest in some 600 years, and that solar cycles 21 and 22 were the 2nd and 3rd highest in 600 years. Going from cycle 19 to cycle 21,22 was like turning the burners down from 11 to 10 !! Well done for CONFIRMING that TSI has just been through a Grand Solar Maximum that started mid last century. And sorry Bill, but since 1979, the only so-called warming has come Regional effects of the El Nino and ocean oscillations. Places and time periods that are not directly affected by those El Ninos, show basically zero warming. There is absolutely no CO2 signal in the satellite data. Let’s all hope that average cycle TSI doesn’t drop down below 1361 and stay there for a while, hey! Like most people, Bill included no doubt, I prefer slightly warmer rather than colder. Bill you did realise that your TSI chart shows that 9 of the last 10 solar cycles have been the strongest solar cycles in some 400 years, didn’t you ? Apparently it is often not realized that it is necessary to take the time-integral of a forcing (or a proxy such as sunspot numbers for a forcing) to logically compare with anything related to temperature change. It is like not being aware that energy is the time-integral of power. Claiming 0% solar forcing and 100% human forcing for climate change shows the purely political nature of what goes on for goofy climate science these days. Stop all tax payer funding for this garbage. Force objectivity for acceptable study of the subject before funding. you are utterly uninformed. Real scientists have always looked at all aspects. this would take all funding from denialist “science” at once. Um, sod, that little blue line that supposedly represents “all natural” forcings is based on models of solar irradiance that pre-suppose that the Sun has no influence on climate change. The IPCC ignores science that does not agree with their agenda so as to advance the humans-cause-deep-ocean-waters-to-heat-up presumption model. Their next report will once again ignore the 300+ papers published since 2014 that link solar forcing to climate change. It doesn’t help the cause to consider science that doesn’t agree with one’s beliefs. Everyone who spend a second doing research on this subject knows, that the 0% number is false and the 100% number is false. And the well known picture i linked above is PROOFING this. It is a fact. I am right and Sam was wrong. It is a fact. None of it is fact. The observed isn’t even “fact” it fabricated manipulated junk from GISS or HadCrut. You have just PROVEN to everyone that climate scientists are NOT real scientists. You agree with Gavin, right, sod? By the way, since it’s ~110% human forcing according to Gavin, would that imply that natural forcing is -10%? Perhaps you can explain Gavin’s thinking on this. He’s a mathematician by training. I guess that’s why he’s so good with the numbers. “You agree with Gavin, right, sod? By the way, since it’s ~110% human forcing according to Gavin, would that imply that natural forcing is -10%?! But your link shows my point. Judith Curry (a scientist, by the way) is giving 50% to 50%. So the claim about scientists is simply wrong. There are even negative andropogenic forcings. The 0% to 100% claim is simply false. “yes” what? You believe that Gavin is right about 110% anthropogenic forcing of climate? “In the last subperiod [2003-2014], the global averaged SULR [surface upwelling longwave radiation/greenhouse effect] anomaly remains trendless (0.02 W m−2 yr−1) because Ts [global temperatures] stop rising. Meanwhile, the long-term change of the global averaged OLR anomaly (−0.01 W m−2 yr−1) is also not statistically significant. Thus, these two phenomena result in a trendless Gaa [atmospheric greenhouse effect]”. Do you disagree with these scientists, sod, who found that CO2 had no effect on temperatures during the same period of time that human CO2 emissions rates rose by 65% (6.1 Gt/yr to 10.1 Gt/yr)? If “yes”, explain why you think they are wrong…and Gavin is right about the 110% human attribution. Sam: What percentages come from your own calculations? Quit lying to the people. Mankind has made a mess of our planet. Quite denying it. That’s right, “silence IS consent,” which is why we are speaking out against the perversion of science by all manner of con artists and their irresponsible ignorant idiot supporters. Wow, what a load of totally brain-washed BS. Do you really believe that CRAP !! You are welcome to leave whenever you like. How’s your computer, iPhone, SUV, heater, refrigerator, your house with bricks, plaster, copper wire, aluminium and glass windows.. etc etc… going ? You obviously haven’t divested yourself of the benefits of modern society, have you. Until you have.. perhaps you should remain silent. Its only certain people that want to live in a inner city latte-sipping, feel-good, greenie utopian ghetto. Every farmer I have known absolutely CARES for his land. Coal companies do their upmost to re-facilitate the land after coal extraction. Its only the renewable pseudo-industry that leave rotting husks of solar and wind turbine littering the land. The problem is that the green agenda wants to keep developing countries in poverty, thus did-allowing their development to a cleaner environment. Its CRUEL and its INHUMAN. The Sun’s intensity has been decreasing since the mid-60s, averaged over the solar cycles. It is delivering less and less energy to Earth. So how exactly is it causing global warming? Perhaps you should read some of the papers, David. The assumption that “the Sun’s intensity” is the only means by which the Sun influences climate is where you seem to be having difficulty. There has been no scientific experiment or physical measurement that indicates varying CO2 concentrations in volumes of parts per million (0.000001) over a body of water causes heat changes in that body of water. No observational evidence whatsoever. If you think there is some, please provide the citation. So how exactly is CO2 causing global warming if we don’t even have scientific evidence its variance heats up or cools the ocean? 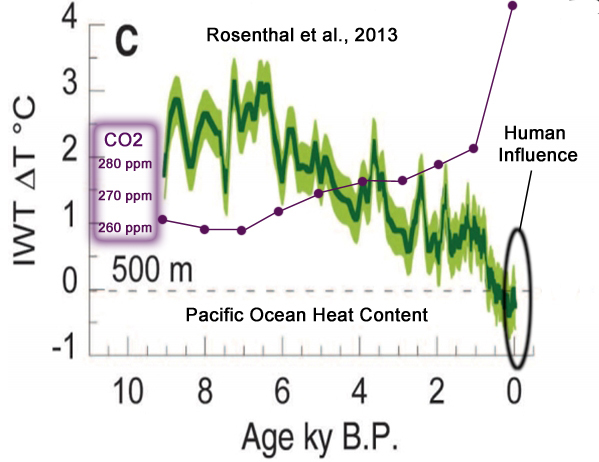 And why was the ocean so much warmer than now with much lower CO2 levels? Will you ever answer these questions, David? We explored the sources and characteristics of each pigment, reconstructed an 800-year record of ultraviolet radiation (UVR) and total incoming light intensity, and identified the possible factors that may have influenced historical UVR changes in this region. The results indicated at least four UVR peaks during the past 800 years, corresponding to c. AD 1950–2000, 1720–1790, 1560–1630 and 1350–1480, with the intensity from the most recent [1950-2000] sediments being the highest.